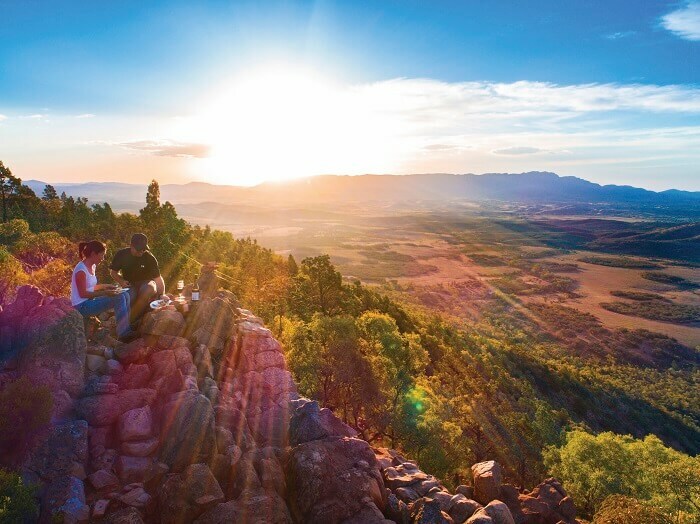 Explore Australia’s rugged outback on a six-day Alice Springs to Adelaide tour that takes you to the area’s most iconic landmarks and lets you experience the diverse and eclectic landscape that makes this part of Australia so magnificent and surreal. Camp under the stars for an unforgettable experience under the Milky Way, be in awe of the amazing change of colours of Uluru at sunset and hike some of the most spectacular scenery in Australia. 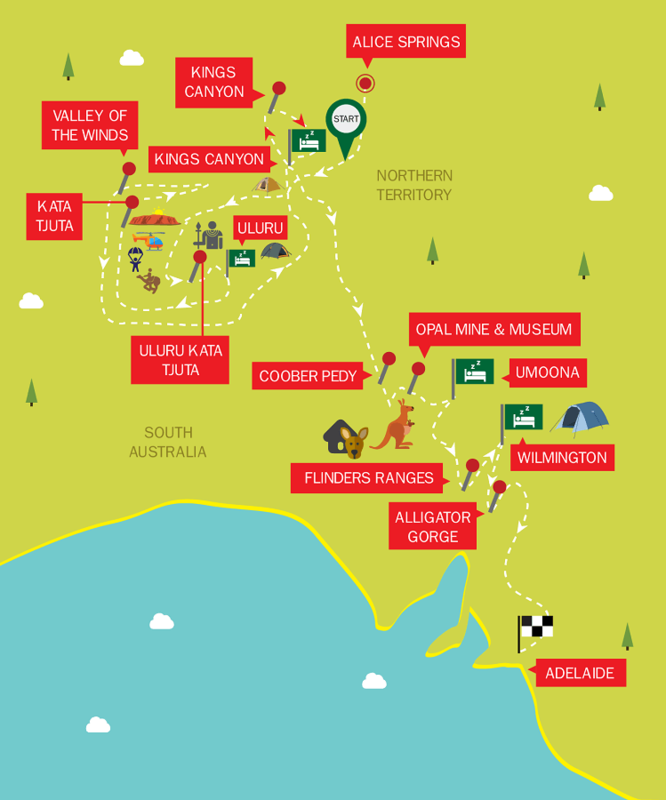 The 6 Day Alice Springs to Adelaide Tour with Uluru is a true Outback Aussie experience! Please note: Pickup from Ayers Rock is available on the first day of the tour. We can pickup from both the airport and Yulara Campground however airport pickups will not be guaranteed and you may need to catch a shuttle bus to Yulara Campground to meet the tour. Minimum age is 11 years old. Children traveling under the age of 16 years old will need to upgrade to a private room. Some hikes involve steep climbs in extreme heat during summer. A reasonable level of fitness is therefore required for this tour. We do not recommend this tour for travellers over 60 years, however contact us if you consider yourself young at heart and still wish to join. Comfortable walking shoes, 3L water bottle (2 x 1.5L), insect repellent, sunscreen, weather appropriate clothing (including a rain jacket and a long sleeved cotton shirt), swimmers, towel hat and sleeping bag. 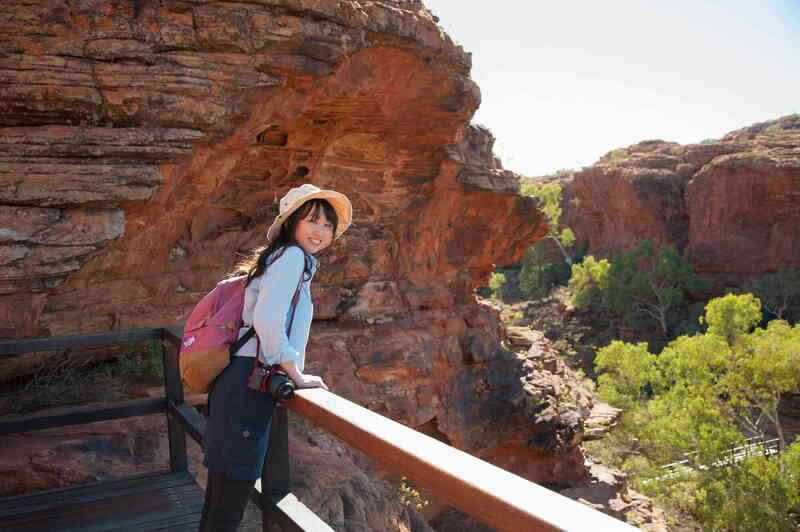 Our 6 Day Alice Springs to Adelaide with Uluru Detour will allow you to explore the best of Australia’s Red Centre and South Australia. 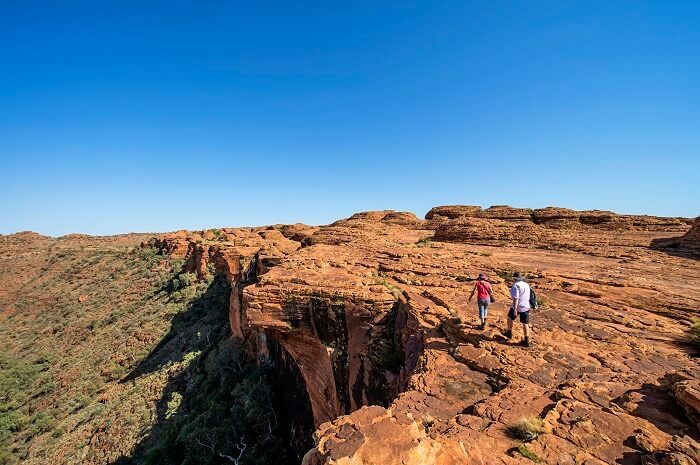 Experience sleeping under the stars in swags, and witness the glorious sunrise over Uluru, before setting up to hike among waterholes and gorges of Kings Canyon. Be awe-inspired by the spectacular lookouts as you hike through the Valley of the Winds and witness the breathtaking views of the domes and its surroundings. Visit the Josephine’s Kangaroo Orphanage to meet Australia’s native animals and explore the underground mining town of Cooper Pedy. 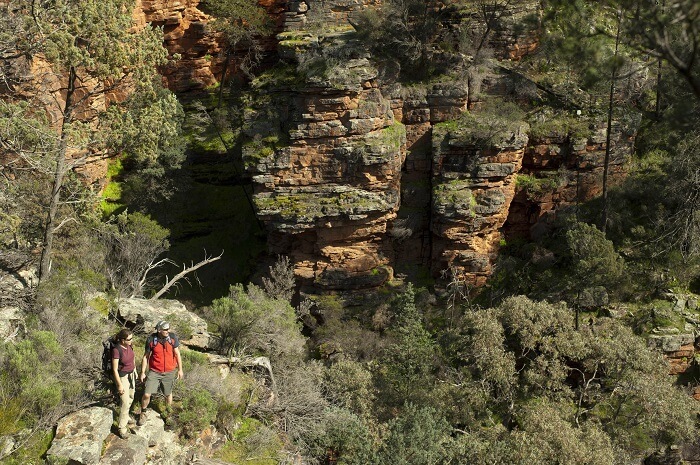 Walk through the Aligator Gorge and much, much more before arriving in Adelaide. The tour starts from Alice Springs, where we’ll make our way through the incredible scenery of the Outback to Uluru. 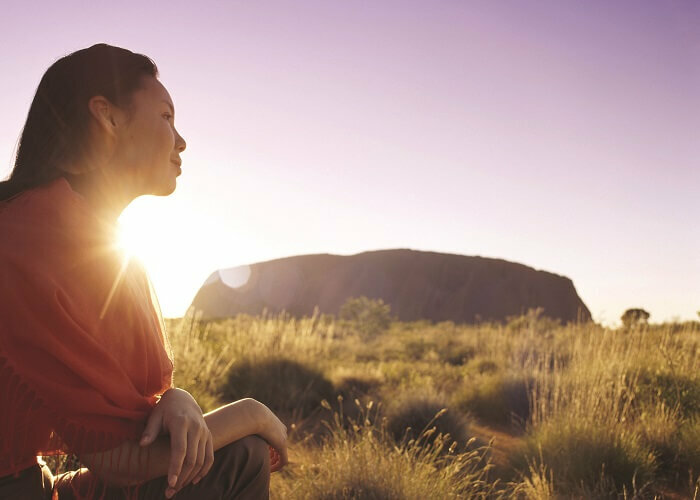 While at the country’s most iconic landmark, you’ll have the chance to learn all about the area’s fascinating Indigenous history and the Uluru Kata Tjuta Aboriginal Cultural Centre. Afterwards, we’ll take a walk around the base of the monolith before finishing the first day of the tour watching the sunset over Uluru. At night, we’ll camp under the stars in a comfortable swag. After an early start on day two, the tour makes our way straight to Kata Tjuta to watch the sunrise. Then, it’s on to the Valley of the Winds, where you can experience the incredible ancient rock formations and marvel at stunning views. When you’ve taken a hike, we head to our campsite at Kings Canyon. Please check with us for availability if you are interested in these activities. 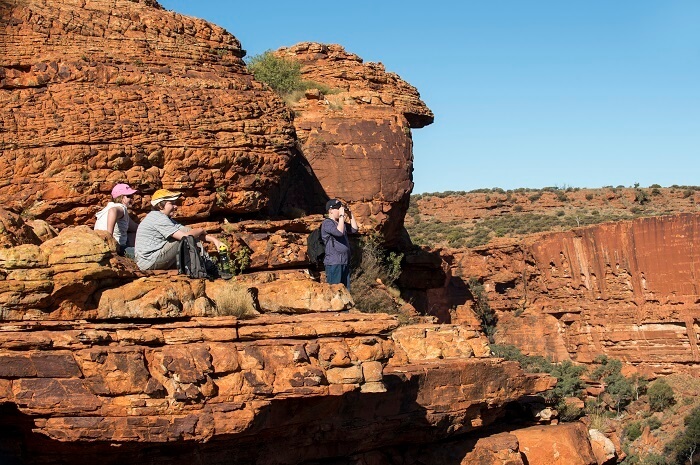 We’ll wake early in Watarrka National Park today, where you can soak up the beauty of the soaring sandstone walls of Kings Canyon and take the impressive Canyon Rim Walk. Along the way, we’ll stop off at the stunning Garden of Eden and learn all about the rich Aboriginal history that imbues the area. Afterwards, we head to one of our campsites at Kulgera, Erldunda or bush camp and set up for the night. On day four of the tour we’ll make our way to the Opal City of the World, Coober Pedy. While here, you’ll get to visit the Opal Mine and Museum and head to Josephine’s Kangaroo Orphanage to meet rescued kangaroos and joeys. Later on in the day, we’ll tuck into delicious pizzas before bedding down in a traditional underground bunkhouse. We’ll end our Alice Springs to Adelaide Tour with a stroll through Alligator Gorge – keep your eyes peeled for native wildlife. We’ll tuck into a final lunch together before we head to Adelaide for our final leg of the Alice Springs to Adelaide Tour.